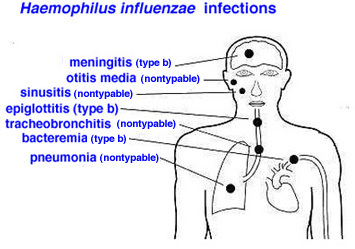 Tag words: Haemophilus, Haemophilus influenzae, H influenzae, H flu, Hib vaccine, meningitis, Hib meningitis. Naturally-acquired disease caused by H. influenzae seems to occur in humans only. In infants and young children (under 5 years of age), H. influenzae type b causes bacteremia and acute bacterial meningitis. Occasionally, it causes epiglottitis (obstructive laryngitis), cellulitis, osteomyelitis, and joint infections. Nontypable H. influenzae causes ear infections (otitis media) and sinusitis in children, and is associated with respiratory tract infections (pneumonia) in infants, children and adults. Seven serotypes of the bacterium have been identified on the basis of capsular polysaccharides. H. influenzae type b is the most important serotype involved in meningitis. Disease caused by H. influenzae usually begins in the upper respiratory tract as nasopharyngitis and may be followed by sinusitis and otitis, possibly leading to pneumonia. In severe cases, bacteremia may occur, which frequently results in joint infections or meningitis. Infection with Haemophilus influenzae type b (Hib) can result in meningitis and other severe infections (e.g., pneumonia, bacteremia, cellulitis, septic arthritis, and epiglottitis) primarily among infants and children <5 years of age. Hib disease is uncommon in individuals 5 years of age or older. Hib meningitis has a case-fatality ratio of 5-10% in the United States even with initiation of early antimicrobial therapy. As a result of the widespread use of Hib conjugate vaccines, the disease is now uncommon in the U.S. and is seen primarily in infants too young to be vaccinated and unvaccinated children. According to the CDC, in 2004, the estimated annual incidence of Hib was 0.15 cases per 100,000 in children younger than 5 years of age. The pathogenesis of H. influenzae infections is not completely understood, although the presence of the type b polysaccharide capsule is known to be the major factor in virulence. Encapsulated organisms can penetrate the epithelium of the nasopharynx and invade the blood capillaries directly. Their capsule allows them to resist phagocytosis and complement-mediated lysis in the nonimmune host. Nontypable (non encapsulated) strains are less invasive, but they are apparently able to induce an inflammatory response that causes disease. Outbreaks of H. influenzae type b infection may occur in nurseries and child care centers, and prophylactic administration of antibiotics is warranted. Vaccination with type b polysaccharide (in the form of Hib conjugate vaccines) is effective in preventing infection, and several vaccines are now available for routine use. Figure 3. Tissues infected by type b and nontypable strains of Haemophilus influenzae. H. influenzae does not produce any demonstrable exotoxins The direct role of endotoxin in meningitis or bacteremia is unclear, although the Gram-negative bacterium's outer membrane lipooligosaccharide (LOS) is thought to play a role in inflammation associated with otitis media. All virulent strains produce neuraminidase and an IgA protease, but the role of these extracellular enzymes in invasion is unproven. Fimbriae increase the adherence of bacteria to human mucosal cells in vitro, and they are required for successful colonization of the nasopharynx. The Anton antigen, as defined in red blood cells, appears to be the receptor. Virulence, at least in the case of bacteremia and meningitis, is directly related to capsule formation. Virtually all of these infections are caused by the type b serotype, and its capsular polysaccharide, containing ribose, ribitol and phosphate, is the proven determinant of virulence. The capsule material is antiphagocytic, and it is ineffective in inducing the alternative complement pathway, so that the bacterium can invade the blood or cerebrospinal fluid without attracting phagocytes or provoking an inflammatory response and complement-mediated bacteriolysis. For this reason, anticapsular antibody, which promotes both phagocytosis and lysis of bacteria, is the main factor in immune defense against H. influenzae infections. Type b H. influenzae is plainly the most virulent of the Haemophilus species; 95 percent of bloodstream and meningeal Haemophilus infections in children are due to this bacterium. In contrast, in adults, nontypable strains of H. influenzae are the most common cause of Haemophilus infection, presumably because most adults have naturally acquired antibody to PRP.